ESI provides the best in geosynthetic materials! – Long-standing relationships with the industry’s leading manufacturers. 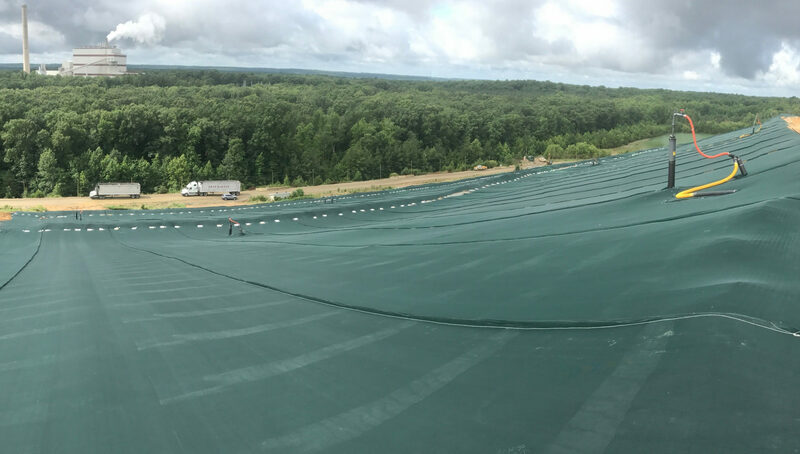 – One of the largest buyers of geosynthetics in the nation. 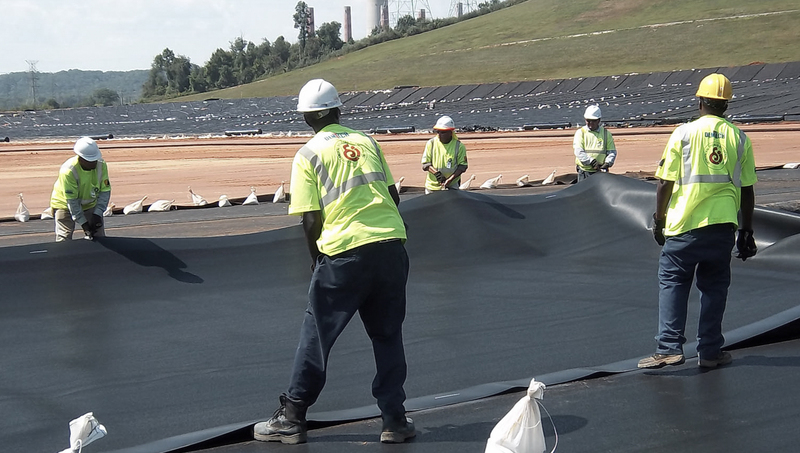 Also referred to as a liner, a geomembrane is an impervious synthetic membrane barrier used to contain and/or control liquids and/or gas. Examples include high-design polyethylene (HDPE), linear-low density polyethylene (LLDPE), polyvinyl chloride (PVC) and others, each designed for specific application benefits. Conductive liners are also available for leak detection. 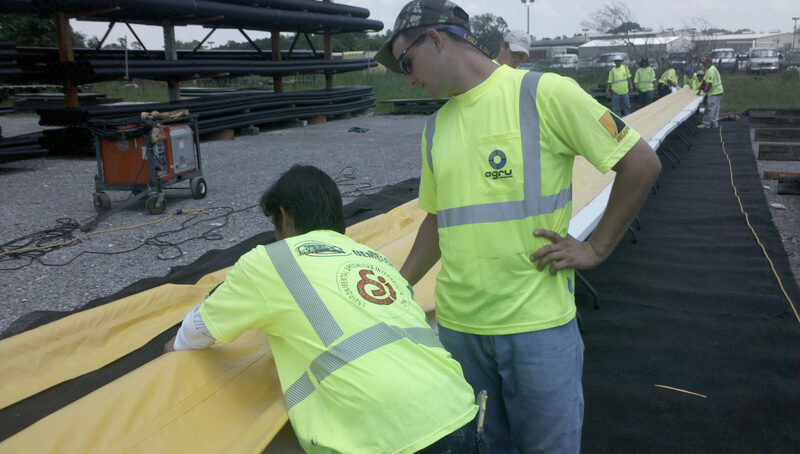 Liner thicknesses range from 8-mil to 60-mil and may be reinforced. Providing very low hydraulic conductivity, GCLs are manufactured liners consisting of sodium bentonite fixed between fabric or geomembrane liners. Sodium bentonite naturally swells when wet, providing self-healing characteristics useful for applications where liquid containment is critical. GCLs are generally used in place of earthen compacted clay and in combination with geomembranes and other geosynthetics. 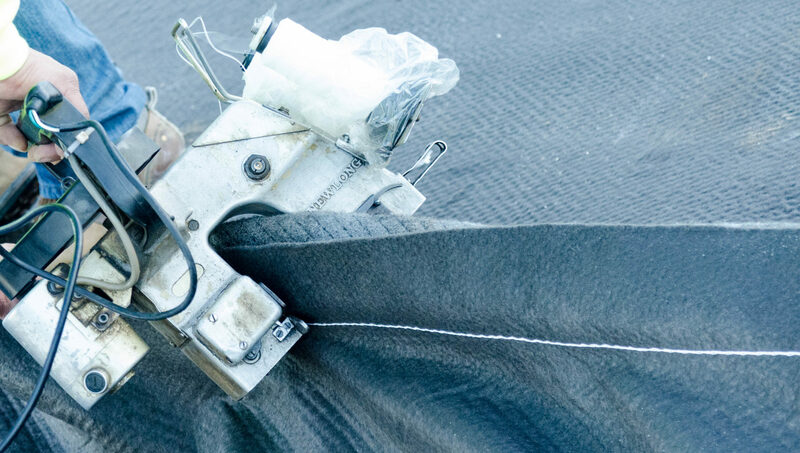 As permeable fabrics, generally non-woven and needle-punched polypropylene, these materials are used for applications requiring soil stabilization, erosion control, drainage, or to provide cushion to other geosynthetic layers. As mentioned below, they are also bonded to geonets to create geomposites. Imagine a net made of rigid plastic and you have a geonet. They are available in nearly infinite combinations of thicknesses with overlying interconnected ribs at various interconnections and angles. 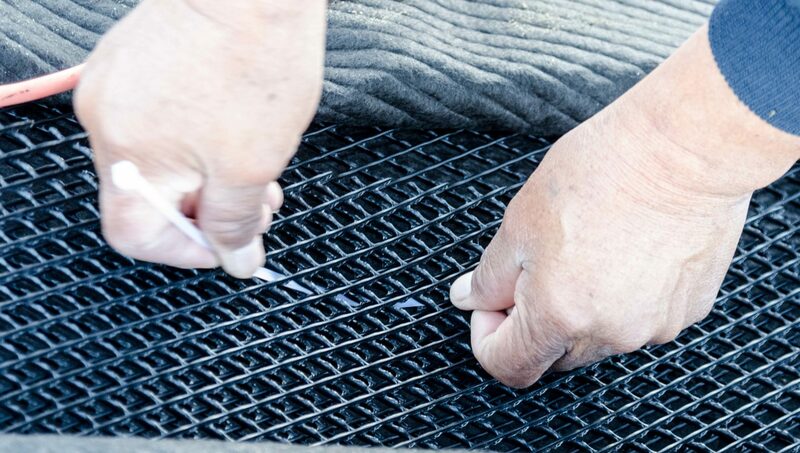 Now, bond a geotextile to either side (or both) of the geonet, and a geocomposite is created. Generally used for drainage, gas venting, or erosion control, these materials are widely used throughout the industry. High-density polyethylene (HDPE) pipe is used for containment and transfer of liquids and gases. Providing very high chemical, corrosion and crack resistance, HDPE pipe is extremely durable and lightweight, with superior flow characteristics. Because of the material properties and performance characteristics, HDPE pipe is used in harsh chemical applications including leachate collection, landfill gas, and others. A unique and alternative reinforced geotextile windscreen made of knitted, and UV stabilized HDPE filament. 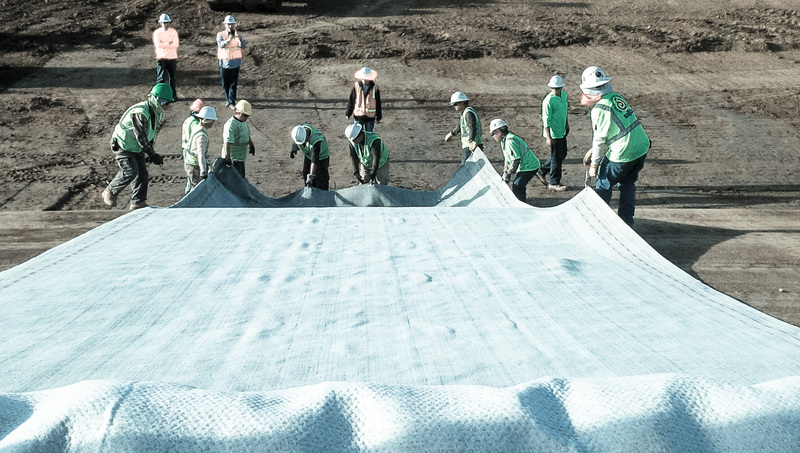 The product acts as a ballast system to protect underlying geosynthetic liners from damage and UV exposure. It thereby replaces and eliminates the need for sand bags, belting, and other other ballast methods. Provides lower overall cost of ownership. May also be placed directly on stockpiles for dust control. 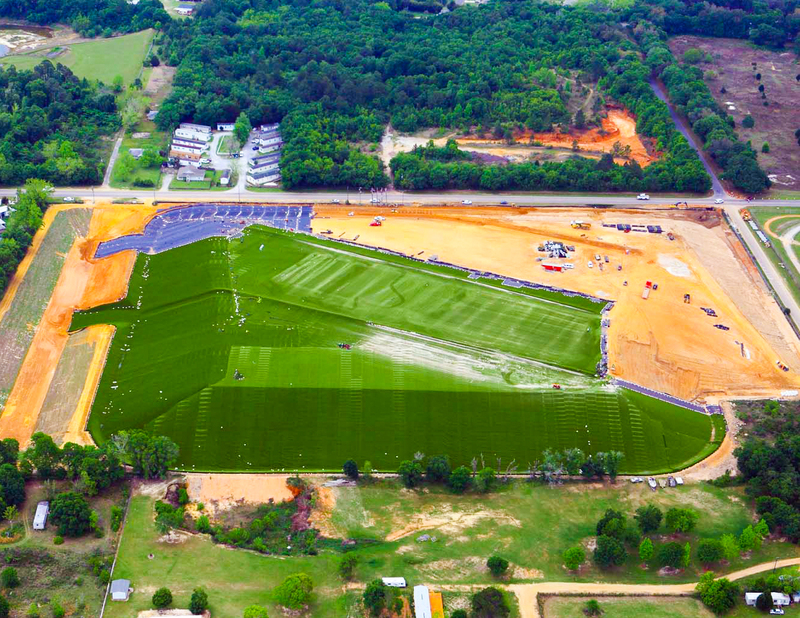 Shipped as a manufactured composite system, artificial turf systems are increasing in use as landfill closure systems. For sites that have limited soil and thus high cost of closure, artificial turf systems may provide lower overall costs. 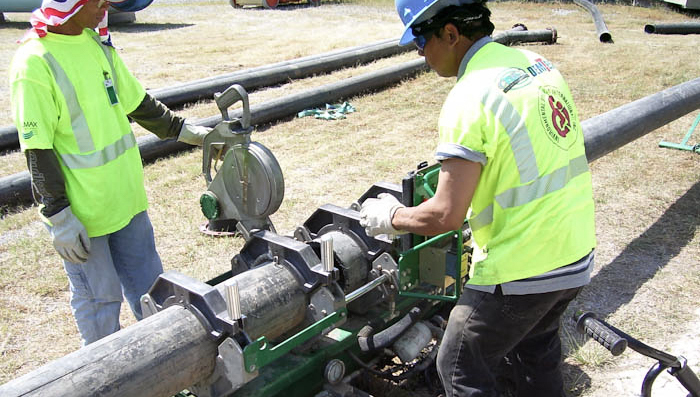 ESI is the largest installer of artificial turf systems for landfill closure systems in the nation. ESI distributes MolecuLoc™, an environmentally responsible way to handle land-based petroleum spills. Using a 100% earth-safe formula, MolecuLoc traps hazardous hydrocarbon molecules and discharges the hydrogen portion harmlessly into the atmosphere. Reusable and recyclable, this rapid response spill mitigation system is highly cost effective and environmentally friendly.